When this album started out with the mournful strains of a solitary cello that escalated into a dense wall of noise punctuated with "haunted monastery" chants, I expected the worse. I expected another foray into the depths of dark metal by a mediocre band whose only real link to music was via imitation of other mediocre dark metal bands. I was wrong. 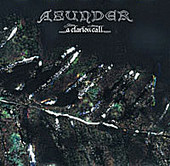 Asunder is a band that understands how to construct an aural monolith of staggering proportions. Taking the freeform dirges pioneered by the likes of SKEPTISM or DISEMBOWLEMENT and mixing it with the classical vibes prominent in the dark metal, ASUNDER has developed a breed of quasi-doom that is distinctive and menacing. Not haunting - menacing. This isn't atmospheric music that swirls around you like some amorphous mist; this is an atmosphere that is tangible and thus suffocating. It is the sense of imminent harm versus a nebulous hint of danger. If this CD were to ever gain a widespread audience the pharmaceutical industry, specifically the arm of the industry dedicated to anti-depressants, would double its profits.